First off, let me just give a shout out to friends who literally force you out of your house and drag you on an adventure because they know it’s good for you lol. I got the honor and privilege to be kidnapped by my girl VTyler Photos and crash her engagement session at the sand dunes in Glamis. Something about girl time and road trips is just so therapeutic and I definitely need to do it more often. I’ve been in such a weird season, so this adventure came just in time to recharge those creative juices. QUE THE DUNES. I’ve never been to do the dunes in Glamis before this shoot. Drove by it plenty of times, but never stopped. Man have I been missing out!!! I’ve never considered myself a desert person, that dry heat just never appealed to me, but oh man was I wrong about it. You guys, the desert is freaking amazing and the most glorious place to do some steamy engagement sessions (and boudoir!). Something about that desert sun just makes everything magical. Don’t believe me? Check it out for yourself! 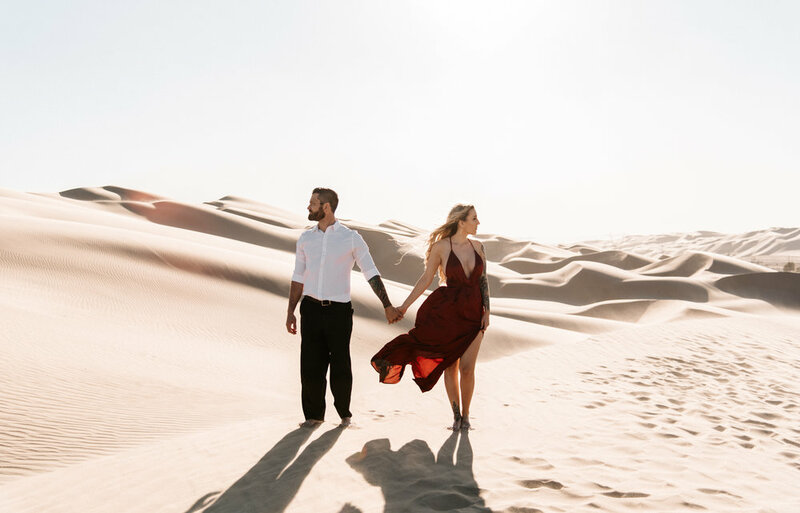 Are you looking for a bold + modern photographer to shoot you and your boo at Glamis Sand Dunes? Holla at your girl.